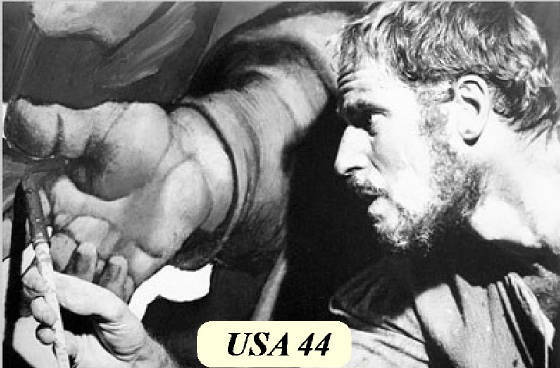 Charlton Heston Gets His Stamp! 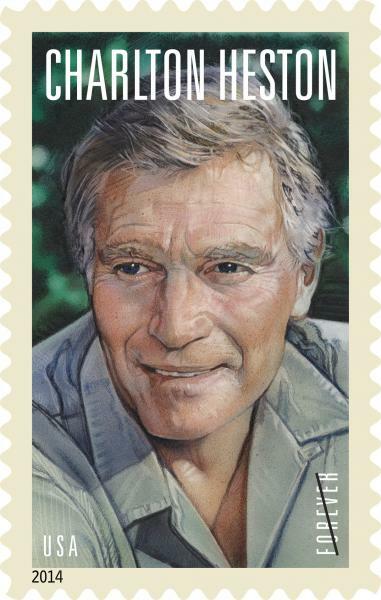 On April 11, 2014, Charlton Heston finally appeared on his own postage stamp. The Charlton Heston Forever Stamp unveiling took place at the historic Hollywood Chinese Theatre and the ceremony was part of TCM's 2014 Classic Film Festival. See full articles below. On October 4, 2010 - which would have been Heston's 87th birthday - Michael Levine (Chuck's former publicist) announced an online petition campaign to reward Chuck with a postage stamp in his honor. Heston officially became eligible starting in 2013, five years after his passing. Turner Classic Movies (TCM) and the United States Postal Service®(USPS) will salute Charlton Heston with the issuance of a brand new commemorative Forever® postage stamp featuring the Oscar®-winning actor. The official First Day of Issue Ceremony will take place at Hollywood's historic TCL Chinese Theatre IMAX® on Friday, April 11, at 10 a.m. during the 2014 TCM Classic Film Festival. TCM's Ben Mankiewicz is set to host the ceremony, which will be attended by members of Heston’s family, including Heston’s wife Lydia Clarke Heston, who took the photograph on which the stamp is based, and his son, filmmaker Fraser Heston, his daughter Holly Rochell and other honored guests. Immediately following the ceremony, the USPS will offer collectible First-Day-of-Issue postmarks and have the Charlton Heston Forever® stamp and related philatelic merchandise on sale. In addition, the day's honored guests will be on-hand for an autograph session. TCM's celebration of Charlton Heston will continue at noon, when festival passholders have the opportunity to attend the World Premiere screening of the newly restored Touch of Evil (1958), to be introduced by Mankiewicz and Fraser Heston. And one week before the ceremony, Mankiewicz will present a night of Charlton Heston films on TCM Friday, April 4, beginning at 8 p.m. (ET). "Charlton Heston brought an intensity and power to the screen that few could ever match and nobody could ever forget," said Mankiewicz. "He commanded the screen with memorable performances that stood out against even the most spectacular backgrounds. It's an honor to be taking part in this special celebration of Heston's unique contributions to motion pictures." Heston is the 18th star to be honored as part of the USPS' "Legends of Hollywood" series, which first launched in 1995. Past stamps have celebrated such Hollywood greats as Marilyn Monroe, James Dean, Humphrey Bogart, Lucille Ball, Audrey Hepburn, John Wayne, Judy Garland, James Stewart, Bette Davis, Gary Cooper, Katharine Hepburn and Gregory Peck. “On behalf of my mother, Lydia; my sister, Holly Rochell; and the entire Heston family, I can say enthusiastically how deeply grateful we all are that my father, Charlton, has been honored with a 'Legends of Hollywood' postage stamp," said Fraser Heston. "In many ways, a nation's stamps are a cross-section of a culture, its ideals and icons, in microcosm. As a fervently patriotic American, my father would be deeply moved to know that his image, based on one of my mother’s photographs, will be on a United States Forever Postage Stamp. We look forward with great anticipation to the unveiling of the stamp at the Chinese Theater in Hollywood on April 11." The Charlton Heston stamp ceremony is one of many events being staged in celebration of TCM's 20th Anniversary as a leading authority in classic film. The anniversary coincides with the TCM Classic Film Festival, which takes place Thursday, April 10 – Sunday, April 13. "One of the ways we are celebrating TCM's 20th anniversary is by giving fans the chance to experience some of that Hollywood magic up close," said Jeff Gregor, Turner Entertainment Networks chief marketing officer and general manager of TCM. "We look forward to welcoming classic movie fans from around the world as we unveil the Charlton Heston commemorative postage stamp during the 2014 TCM Classic Film Festival." At a ceremony in Hollywood, those who knew him said the star of "Ben Hur" and the original "Planet of the Apes" was unafraid of stirring political controversy. Charlton Heston, the movie star, political activist and former head of the National Rifle Association, got his own postage stamp on Friday, unveiled at a ceremony at the historic Chinese Theatre in Hollywood. 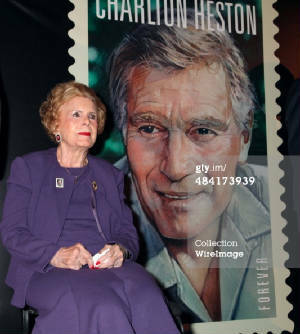 The stamp bearing Heston's image is a painting taken from a photo shot by his widow, Lydia Clarke Heston, who attended Friday's ceremony, which was part of the TCM Classic Film Festival in Hollywood. The Heston stamp is three years in the making and began with lobbying from Michael Levine, the actor's publicist of 21 years. Heston is the 18th stamp in the Legends of Hollywood series from the U.S. Postal Service. Earlier ones included John Wayne, James Dean, Marilyn Monroe, Gregory Peck, Gary Cooper and Lucille Ball. The ceremony, which preceded the worldwide premiere of the newly restored 1958 Heston film Touch of Evil, included remarks from representatives of the postal service as well as members of SAG-AFTRA. Heston was president of that organization's precursor, the Screen Actors Guild, from 1965 to 1971. The speakers, who included son Fraser Clarke Heston, a filmmaker who directed his father in the 1990 TNT movie Treasure Island, noted that Heston's political activism was sometimes controversial. Several reminisced about Heston picketing against segregation in 1961 and marching with Dr. Martin Luther King Jr. in 1963, when it took courage to do so, and remarked about his passionate support of the NRA. "Heston fundamentally embodied a commitment to fight for what he valued -- no matter where or when he was needed," said Ned Vaughn, the founding executive vp of SAG-AFTRA. "Later in his life, some of those fights would earn him contempt from some of his colleagues in the entertainment industry. Becoming a Republican and giving his unwavering support to the work of his good friend Ronald Reagan. Giving compelling voice to his concerns about political correctness and cultural decline in our society, and, of course, fighting to protect the Second Amendment." The event, hosted by TCM's Ben Mankiewicz, also included a video montage of Heston's work, with clips from Ben Hur, The Ten Commandments and the original Planet of the Apes. After the montage, Fraser Clarke Heston told how his dad learned to drive a four-horse chariot for his Oscar-winning role in Ben Hur. When he worried he wasn't good enough to realistically race against several other teams in the arena, stunt director Yakima Canutt told him: "Chuck, you just make sure you stay in the chariot. I guarantee you're gonna win the damn race." After the event, Levine told The Hollywood Reporter  that when he launched his effort to put Heston's image on a stamp at a press conference three years ago, only one prominent person showed up: conservative political commentator Bruce Herschensohn. "For the first two years, it wasn't easy and it wasn't popular. My sense is because of his work with the NRA," Levine said. The effort gained steam about a year ago through a public petition and some friendly media, particularly from Christopher Ruddy and his Newsmax magazine, Levine said. "Heston was an extraordinary guy, not just an extraordinary actor. He was a very unique man," Levine said.